The $67 bln chemical giant is promising more cuts and a bigger buyback to fend off the activist investor. But it’s already barely hitting estimates. A stronger dollar and falling commodity prices will make that even harder in 2015. DuPont boss Ellen Kullman is on the back foot. The billionaire activist is seeking four board seats at the chemicals group, his first public contest since Heinz nine years ago. Flexing muscle sends a message to other stubborn targets, like Pepsi. It also gives younger staff at Trian Partners experience in the trenches. The French materials group is seizing control of Swiss peer Sika by paying $2.8 bln for a minority family stake which has majority voting rights. Sika’s board is laudably indignant. And Saint-Gobain’s tactics have a hidden cost of upsetting other investors and the target’s staff. CEO Ellen Kullman touted the $62 bln chemical giant’s scale and research capabilities in opposing the activist’s call for a breakup. But she offered no hard numbers to counter Peltz’s claim that the company could lop off $4 bln in excess costs. That was a missed opportunity. Rob Cox: Is "stranded costs" a euphemism for fat? The answer to that question may determine the winner in the latest activist battle to captivate Wall Street: Nelson Peltz’s siege of DuPont. The billionaire’s controversial arithmetic suggests the chemicals giant has grown bloated over its 212 years. He’s on to something. The activist wants the $60 bln U.S. giant to separate into a fast-growth agriculture unit and a cash-generating chemicals rump. 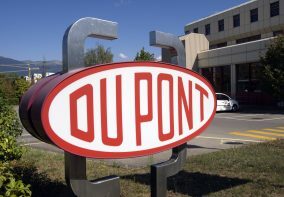 At DuPont’s trading multiple, though, just splitting won’t boost the stock much. Cost-cutting may create more sustainable value, but it’s a harder path. The German specialty chemicals company is buying a 9 percent stake in a first-tier soccer team, emulating Adidas, Audi, Allianz and Bayern Munich. But Evonik’s products don’t reach end users. The potential benefits of its deal with Borussia Dortmund are hazy at best. Shares leapt on a report Syngenta had held abortive talks with rival Monsanto, in the latest tax-driven push by a U.S. acquirer. There would be big antitrust obstacles. Even if no deal emerges, the bid talk should pressure the Swiss agribusiness giant to tend to its own garden. FMC, a $10 bln pesticide-to-battery-parts maker, is splitting its fast-growing ag and pharma businesses from stodgier commodity minerals. It’s similar to the breakup activist Dan Loeb wants at Dow Chemical. Boss Andrew Liveris is standing firm. FMC’s move weakens his case. Is anyone worth 880 million euros? Merck stock dropped 10 percent after its finance chief left abruptly. The plunge reflects the German pharma group’s challenges and inflated hopes of transformative M&A. Quick completion of its AZ Electronics purchase would calm fraying nerves. The activist investor wants the company to hive off its petrochemicals unit, a more aggressive move than CEO Andrew Liveris has hinted at. Loeb’s analysis looks optimistic, but a sum-of-the-parts analysis suggests merely breaking up Dow could boost its value by a fifth. Spinning off commodity chemicals used in pigments will give investors in the U.S. chemicals giant a choice between a cash-generating mature business and an innovative, growth-oriented one. It’s a sensible split, but the rump needs to re-rate for the shares to see big new gains. Volatile oil prices led the U.S. chemicals giant to miss on earnings. Meanwhile, products based on cheap natural gas boomed. No wonder Dow is shedding crude-linked assets at a faster clip to invest in a gassier future. It’s another example of shale transforming American industry. Fortunately, the Organisation for the Prohibition of Chemical Weapons is far from the economic mainstream. Its existence, however, is a helpful reminder of the power and limits of globalisation, of the importance of governments and of the power of human irrationality. The Belgian chemicals group is paying $1.3 bln for Chemlogics, a privately owned U.S. specialist in compounds used in the oil industry. The deal, Solvay’s biggest since 2011, looks pricey. But there should be tax savings, a sales boost, and a chance to ride the global shale boom. The activist hedgie has dislodged the gas firm’s underperforming boss, John McGlade. That quick win brought him a sharp gain of about $100 mln on his 10 pct holding. For bigger, more lasting success, however, a painstaking transformation of the company is now needed. That’s how much new capital the German steelmaker may need. The RAG foundation, a local rival to the one that controls Thyssen, seems willing to buy a stake. While hurting vanities, this would be an elegant fix to the company’s woes. Pride is a luxury Thyssen can’t afford. Corporate carve-ups are all the rage. Now Israel’s richest man is joining in. Unravelling his sprawling Israel Corp will be complex but worthwhile. There are still countries where conglomerates make sense. But where capital is easily available, markets much prefer simplicity.